I spent a couple of days trying to find a white sheet for this exercise, which believe it or not is actually quite difficult in Thailand because all the bed clothes are usually a patterned quilt and sheet set. I thought about a towel but I didn’t think a towel would be crisp enough so I decided to go with the two orange pieces of cloth that I bought last year and had used in several exercises. Being the cloth that they use to make the monks robes out of and using the girlfriend as a model, this was always going to be controversial. 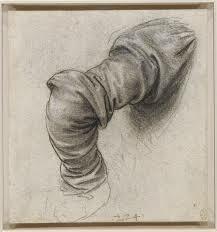 In the last research point an Anatomy Drawing I mentioned a free e-book I downloaded ‘Human Anatomy Drawing for Artists’, in it I came across ‘The Arm of Saint Peter’ by Leonardo da Vinci, where Leonardo ‘uses folds like curving cross-contour lines to describe the cylindrical forms of the arm’ – Dan Gheno, a study that was influential in the next three drawings. 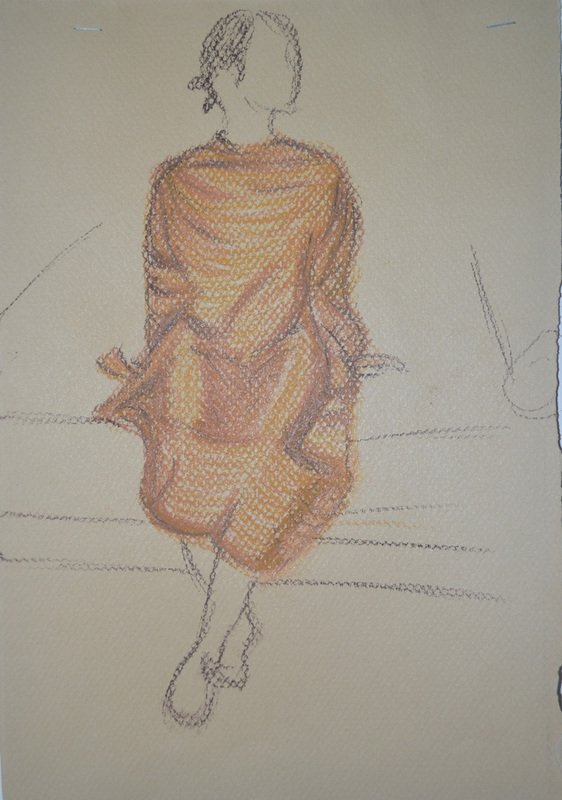 For the first drawing the model was laid on the floor, feet towards me with her head and hands on a bolster pillow, this helped me to draw a partial outline., curving from the elbow down to the waste ‘A figure drawing must first be outlined or suggested before it can be properly drawn’ – George Bridgman. 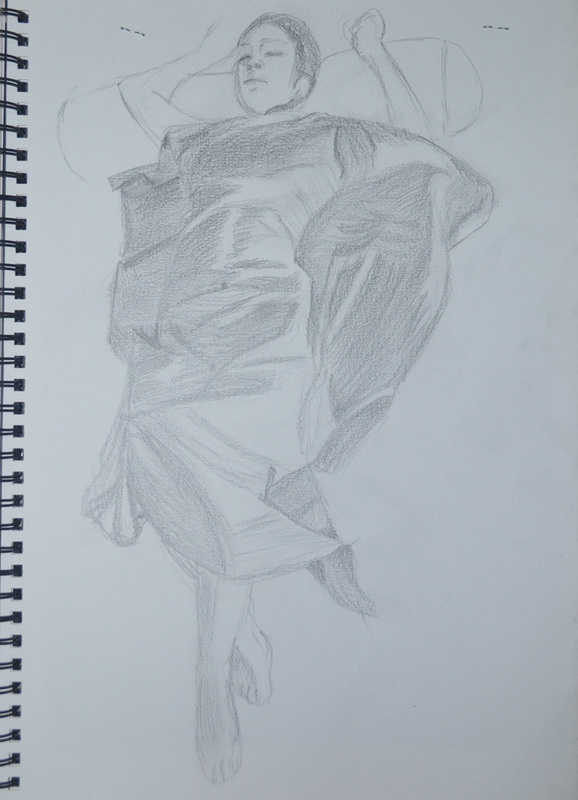 After suggesting the figure, I drew in the outline of the cloth and began hatching with cross-contour lines to describe the box shapes of the chest, waste and hips. 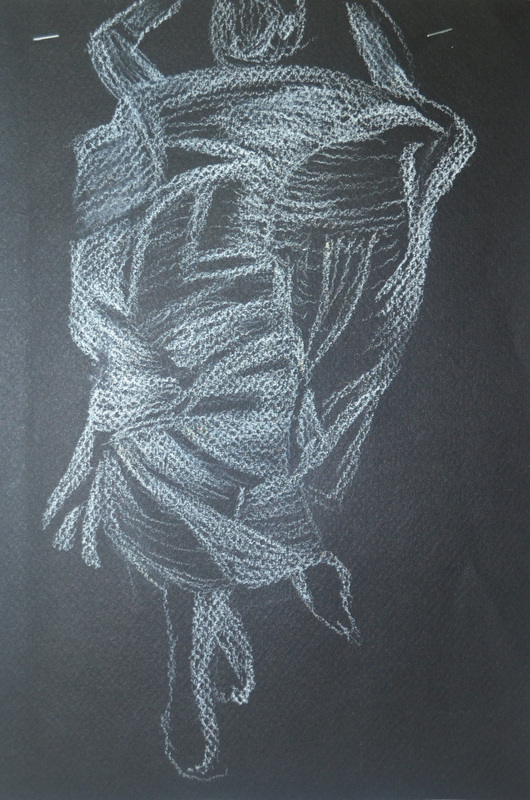 The second drawing was a tonal study which I( drew from the first drawing not from life, in white pastel on black paper. I was going to draw over the top of this in orange pastel and decided I would do the next drawing in orange on coloured pastel paper…again.